A rare beluga whale, a species usually only found in Arctic and sub-arctic waters, was captured on camera off the Antrim coastline late last week. STOP THE PRESS! !A BELUGA WHALE has been filmed off Northern Ireland by Gordon Watson! 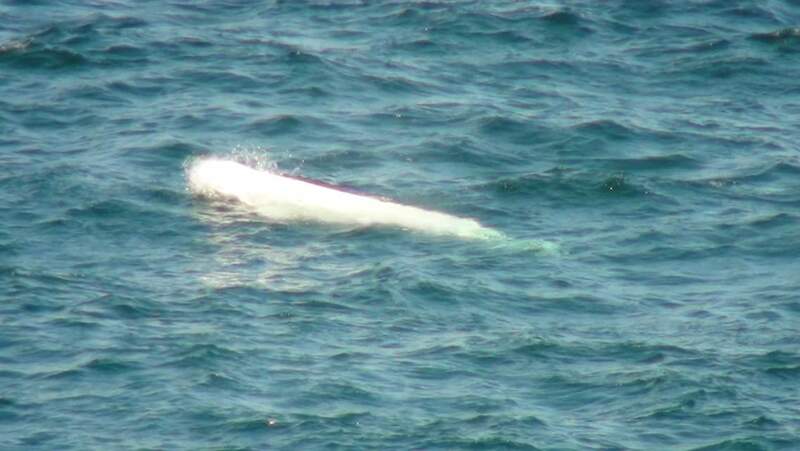 Reported to us by Conor Ryan of Hebridean Whale and Dolphin Trust who spotted a post on facebook, and as soon as our director Peter Evans saw the video, he clearly saw it was a beluga.This sighting from yesterday is a fantastic addition to this year's National Whale & Dolphin Watch! This is the first confirmed report of this rare cetacean in Irish waters since the Irish Whale and Dolphin Group (IWDG) started keeping systematic sightings records in 1991 and only the third ever. The two previous sightings were a report from Clare Island in Co. Mayo in 1948 and one from Cobh in Co. Cork in 1988. The whale was spotted and caught on camera by Ballycastle resident Gordon Watson on a stretch of coastline between Portbraddan and Dunseverick in Co. Antrim last Thursday (30 July). Beluga whales are a species of small toothed whale typically up to 5 metres long. Their bulbous heads and white colouration makes them very distinctive. Despite that early reports generated some speculation about the identification among experts. Discussions were soon laid to rest when the video footage emerged showing what is unequivocally a beluga whale swimming close to the rocky Antrim coastline. This particular whale is several thousand kilometres from home. Belugas occur in a circumpolar distribution at higher latitudes of the northern hemisphere, and are usually restricted to Arctic and sub-Arctic waters. For more information on beluga whales view this species profile on the Irish whale and dolphin group website. If you think you may have seen this whale around the Irish coast over the long weekend, or even better, if you have secured photographs or video footage of it, please contact the IWDG here.